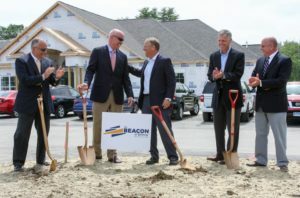 The Beacon at Gateway hosted a ground breaking ceremony this afternoon for the 288 -unit luxury apartment project on Haigis Parkway. About 40 folks attended the ground breaking including Council Members, Town and SEDCO staff, members of the project team and the original property owners. 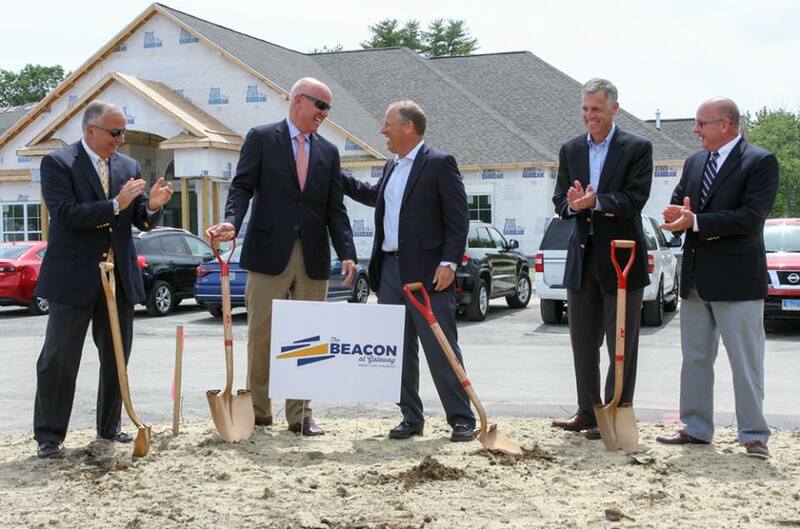 The project is underway, with the first apartments projected to be leased for October 1, 2018 occupancy. A model is anticipated to be available to view in September. The apartments range in size from efficiencies to 3 bedrooms, with the bulk of the units being in 1 to 2 bedroom size. They’ve begun pre-leasing and have a full time property manager. The project will employ 6 full time employees – 3 office and 3 maintenance workers. There is a construction crew of anywhere between 100 to 150 workers on site daily as the project is built. The construction management team is out of state, but the workers are local. Ben Divine, the principal partner in the project and spokesperson for the ground breaking, told the crowd that many people came together to make this project possible. He also spoke of Scarborough’s incredible location as a factor in the future success of the project. Devine explained that the success of the project is due to his team of partners, the ease of working with the Town and the vision of the property owners, who are long-time Scarborough residents. Some 70 Members and guests attended the Scarborough Community Chamber of Commerce’s 2018 Annual Meeting on June 27, 2018 at the Black Point Inn. President Art Dillon opened the Annual Meeting by recognizing long-time Chamber member Jim Elkins as this year’s Scarborough Volunteer of the Year. 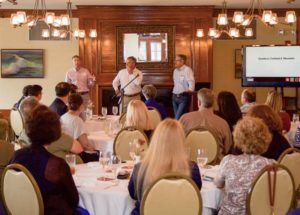 The new owners of the Scarborough Downs property, Crossroads Holding, LLC, served as the keynote speakers for the lunch-time event. The new ownership team includes a partnership of two Scarborough-based businesses – Risbara Brothers Construction Co and Michaud Properties. Dan Bacon with Gorill Palmer is the lead consultant on the team, charged with preparing the masterplan for The Downs property. The project is now officially called the The Downs, with the new logo revealed for the first time at the Annual Meeting. The Downs’ Masterplan includes a mix of residential, commercial, light industrial and retail. With 500 acres in the geographic center of Town, The Downs will be one of the most significant projects in the Town’s history.